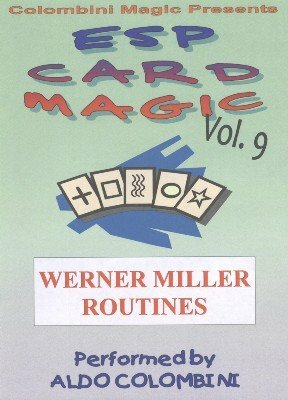 Werner Miller is one of the most prolific creators with regards to ESP cards. All these routines are self-working with no sleight-of-hand whatsoever. ESP TWIZZLER: A symbol is selected and you find a duplicate in a packet of cards. MEETING ONE’S MATCH: A card is selected. Two packets of cards are dealt at the same time and only two symbols match and they also match the selection. QUAD-CUT VARIATIONS: A beautiful routine (totally impromptu) where you and the spectator find five matching symbols from a shuffled deck. AEOLIS PRELUDE: Using a compass you find five different symbols in a deck of ESP cards. DOUBLE PROOF: A prediction or...a comedy prediction, ends up finding the matching symbol of a selected card. DOUBLE-DECKER: Two duplicates of a selected symbol appear between three face-up cards. FLIPDOODLE III: A fantastic routine where a spectator shuffles the deck and at the end four matching symbols are the only reversed cards and they match a previously selected card. AROUND THE CLOCK: A card is selected and you deal the other cards in pairs in the shape of a clock. You predicted the ‘hour’ (10 to 5 for example) and you take the two pairs at that hour. The two pairs match and the symbols are matching the selection. PENTAFLUSH: A spectator is able to pick five matching symbols from a deck of ESP cards. POSITION OF TROST: A fantastic routine with multiple matching pairs. A ‘closer’ for any ESP card act.